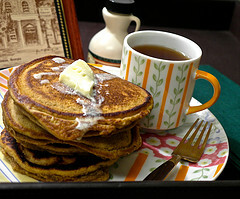 Butternut Squash Pancakes with Whole Wheat and Toasted Pecans ~ Plus Creamy Butternut Squash Soup! Did you receive a holiday gift of Williams-Sonoma's highly prized butternut squash puree? Well, I was a fortunate recipient of this organic, savory puree from my daughter's very thoughtful mother-in-law! You know if someone gives me a food product, I'm probably going to develop a recipe for a post. Although I'm sure the savory soup recipe on the jar is delicious, I wanted to try something different. When I ran a couple of thoughts by my daughter, she immediately zeroed in on the idea of pancakes! For the leftover puree, I developed a sublime, comforting and simple creamy soup. These hearty pancakes are a great way to begin the New Year...enjoy with maple syrup and toasted pecans for a glorious New Year Eve's supper or New Year's Day brunch! A Very Gratifying New Year! In a large bowl, sift together all the dry ingredients and set aside. In a medium bowl, whisk together the milk, squash puree, eggs, vegetable oil and vinegar. Make a well in the center of the dry ingredients and add the wet ingredients. Stir just until combined. Heat a skillet or electric griddle to medium low or 375º, or until a droplet of water skitters around the pan. Lightly grease the skillet or griddle with the shortening. Using a large scooped spoon, measuring cup or pitcher, pour about 1/4 c. of batter for each pancake onto the hot pan...don't crowd the pancakes. For the toasted pecans: Just toast in a frying pan over medium high heat, stirring frequently until they smell fragrant and become lightly browned. You can freeze the pancakes for up to six weeks: Place in an air-tight freezer bag with pieces of wax paper between the pancakes...then place in another freezer bag. Reheat in the microwave by stacking up to 3 frozen pancakes at a time on a microwavable plate and heat on high about 20 seconds per pancake...being careful not to create tough pancakes by overcooking. Add a nice dollop of butter to your stack with a generous amount of maple syrup and toss on some toasted pecans for an extra special treat! You'll enjoy a healthy and delicious start to the New Year with these delightful and comforting pancakes for breakfast, brunch, lunch or supper! For each cup of Williams-Sonoma Butternut Squash Puree, whisk in 1/3 c. half and half and 1/8th tsp. freshly ground black pepper. Heat the soup to a simmer in a saucepot on medium low heat, reduce heat to low and cook just until hot. This puree is well seasoned and spiced; so if you use another butternut squash puree, you might want to add a little more spice and/or seasoning to taste... the spices used in the pancakes are a good guideline, along with salt, if necessary, in addition to the black pepper. Here's to a healthy, prosperous and Happy New Year! After receiving a gift of some gorgeous honeycrisp apples from Harry and David recently, I stopped to think about how I could use them in a simple recipe. 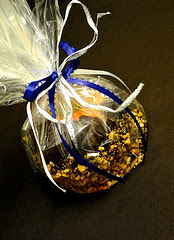 Then I remembered that I'd always wanted to make some gourmet candy-dipped apples! These apples would make a great project with age-appropriate children. They'd also make wonderful gifts for teachers, friends, neighbors, co-workers or as stocking stuffers. I really liked using the caramel bits...no unwrapping to do! Since the caramel and chocolate set quickly, you'll want to get well organized before you start. The impressive presentation of this little project is so deceptive, as these apples are actually very easy to make and wrap...you'll love them! Hope They Make It To Packaging! Line a baking pan with wax paper and spray with the cooking spray. Set aside. Place the chopped peanuts into a small bowl and set aside. Clean the apples and remove the stems and bottoms, along with any bad spots...sprinkle these areas with the Fruit Fresh or lemon juice. Pour the caramel bits into a medium-small saucepan. Add the water and stir constantly over medium-low heat until the bits are completely melted--about 3 minutes. One at a time, set the apples into the melted caramel and spoon the caramel over the apples, leaving about an inch of each apple exposed around the sticks. Allow the excess caramel to drip off the apples. Scrape the bottom of the apples and place into the prepared baking pan, keeping the apples separated. (If the caramel sets up before you finish coating the apples, simply add a tiny bit more of water and reheat over medium-low heat.) Refrigerate the apples for about 1 hour, then remove from the refrigerator and set aside. Line another baking pan with wax paper and spray with the cooking spray. Set aside. Melt the chocolate morsels with the shortening in a medium-small saucepan over the lowest heat possible. When the morsels begin to melt, remove from the heat and stir. Return to the heat a few seconds at a time, stirring just until the morsels are melted. Once the morsels are completely melted, immediately remove from the heat. 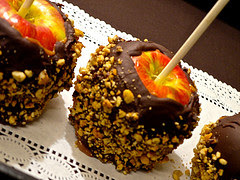 Immediately, while the chocolate is still warm, coat the apples with the chopped peanuts: One at a time, hold the apples horizontally over the bowl of peanuts; and, while turning the apples, spoon the nuts over them, leaving about an inch of the chocolate coating exposed at the top of each apple. Place the apples into the new wax paper-lined baking pan and refrigerate for about 1/2 hour or until well set. For each apple: Center a cardboard disc on a piece of the craft cello wrap. (I left the silver side of the disc down.) Bring the wrap up over the apple, covering all exposed sides of the apple and secure with a twist tie or short strip of ribbon. Tie one strip of the decorative ribbon around the secured area and tie another decorative strip of ribbon over that. Fan the cello wrap a little at the top of the apple. Keep the apples in the refrigerator for up to one week. Your Very Own Hand Creation! 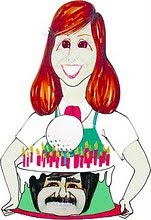 I get calls this time every year for this fabulous recipe! I tweaked it from a recipe I got years ago in catering school, and it makes a great take-along dish. Just for the sake of being more "technically correct," I changed the name to Sweet Potato Casserole instead of Sweet Potato Souffle, as it was originally called. It must be a "Southern thing": the term "souffle" was often loosely used in school. Freezes well - Thaw before adding the topping and cooking. *Use about 1 and 3/4 lbs. sweet potatoes: wash and boil or bake whole, with the skin on, until fork tender; place in a bowl of cold water for about a minute, peel and mash - or use a 40 oz. can of yams in syrup (drain well). I've used either, but my daughter and I have found the canned yams work equally as well as the fresh sweet potatoes. In a heavy-duty mixer, combine the potatoes with the butter. Add all the other ingredients and mix well. Spray a shallow, approximate 9 x 1 1/2 (nine by one and one-half) inches round oven-to-table cookware dish with a butter- flavored cooking spray. Spoon the mixture into the dish. 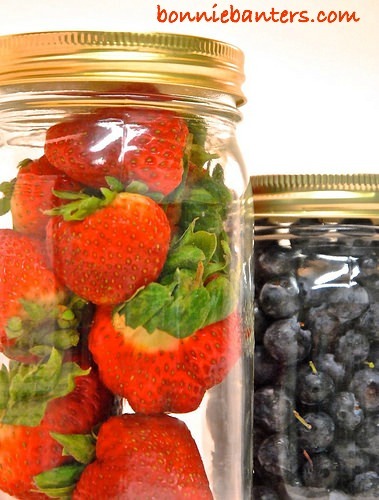 You can make a day or two ahead and keep in a container in the pantry, if you like. *Tip: Crush the corn flakes (not too fine) in the blender, or between two sheets of wax paper with a rolling pin. Combine with a fork the corn flakes, sugar and melted butter. Add the nuts and mix well. (My daughter and I traditionally sneak a couple of tablespoons to nibble - the cook's reward - yummy!) Sprinkle the corn flake topping over the sweet potato mixture and bake for about 25 minutes, or until the topping is golden brown. Gobble Gobble! A sign of the times, or time? While getting dressed one morning recently, I was "half" watching a rerun of an old "Lassie" TV show from the 1954 series. "Gramps," played marvelously by George Cleveland, was sitting at the dining room table with his hand to his head, pondering (another) Lassie/Jeff dilemma. I thought he was on his cell phone, until I saw him get up to use the old wall crank phone! That made me wake up! I hope you and yours enjoy a "Norman Rockwell" Thanksgiving like one you know "Gramps," Jeff and his mother, Ellen, would have had! Finally sharing what I used to refer to as my heart attack mashed potatoes...just in time for Thanksgiving! They are the epitome of classic, rich mashed potatoes. While yummy and creamy (but not soupy), they have a real potato taste! 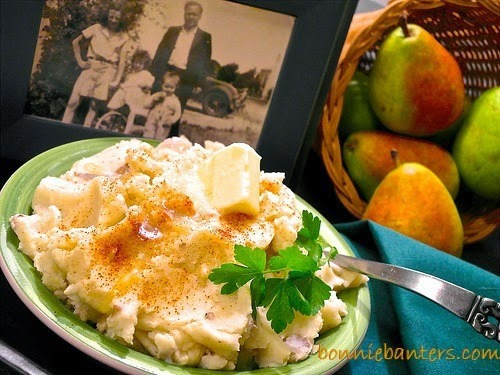 I insist on using Idaho potatoes for this recipe; but my secret for these decadent, rustic mashed potatoes is the type of milk I use. I call this milk the poor man's rich cream...it's so inexpensive. As I've told my daughter, this milk should always be on hand...it keeps in your pantry until you open it. It's a great substitute in any baking recipe that calls for whole milk...just mix half water to half of this milk to achieve the equivalent amount of whole milk you need. If you like, you can use it as a cream in your coffee. It has so many options...you'll find it in many of my recipes. You can even make ice cream with it! So what is it already...it's evaporated milk! If you haven't kept evaporated milk as a staple in your pantry before, have I convinced you that you should...it's great in emergencies! By the way, don't bother buying the light evaporated milk...it's just watered down, and you can do that yourself! Good grief, I didn't mean to make this post a tribute to evaporated milk! Place the potatoes into a sauce pot and cover them with cold (about 6 c.) water. Sprinkle about 3/4 tsp. salt into the pot. Bring the potatoes to a boil over medium-high heat and cover with a lid. Boil the potatoes approximately 20 minutes (check after 15 minutes), or until a fork inserted into a couple of potatoes goes in and out easily and the potatoes are tender without being soupy or mushy...don't overcook! Stir frequently with a wooden spoon to keep the potatoes from settling onto the bottom of the pan. Drain the potatoes immediately...you don't want water-logged potatoes! Place the potatoes back into the sauce pot and immediately sprinkle with the salt and pepper (the seasoning is better absorbed at this point). Mash* the cut-up butter into the potatoes. Mash in the evaporated milk, adding a teeny bit more at a time if necessary to achieve a good consistency without being, here again, soupy or mushy. Potato Mashers: *I prefer a smooth potato masher similar to OXO's #34581...not trying to sell this particular masher...I just couldn't find a consistent description of the type of masher I use. Also, I prefer using a masher to using a mixer; and some people even like a little surprise lump here or there in their mashed potatoes. These potatoes should have body, but shouldn't be stiff either...definitely not soupy or mushy (did I say that already?). If it's not possible to serve the potatoes immediately: Before you dish the potatoes into a bowl, you can use a double boiler to keep them warm on low heat for a little while on the stove top. Just keep the potatoes in the sauce pot before you garnish them. Then create a double boiler by bringing a little water to simmer in a large sauce pan with high sides and wider than the pot with the potatoes. Place the sauce pot with the potatoes into the simmering water. Cover the potatoes and stir them frequently, adding a little more evaporated milk if necessary. Leftovers: Stir some chopped green onion (stems and all) into the mashed potatoes and refrigerate until cold. Form the mixture into about 2" patties and fry in a little (equal amount of) butter and olive oil. You'll find these easy potato patties delicious and worthy of making extra mashed potatoes for leftovers! Suggested Thanksgiving Theme: Have each person bring a favorite old family photo, not more than 5" x 6", and share why they love it so much. Place each photo at their place settings! Never thought I'd have so much to say about mashed potatoes! Oh, the older girl in the photo is my mother with her dad and her two half sisters (circa early 1930's, in southern California). Hope your Thanksgiving is as satisfying as these mashed potatoes...they'll be eating them with their eyes before they even sit down! Enjoy! We're just thrilled! My son proposed to his girlfriend a little more than a week ago while on a trip to Ireland! In honor of their engagement, I'm sharing this marvelous apple cake. I served it for dessert the first time she joined the family for dinner...three years ago this fall. The cake was a big hit at that dinner; however, I wanted more of an obvious apple taste. The original recipe called for grated apples...this time, I used sliced apples. I was delighted with the results! The sliced apples offer more of the apple taste that I desired and form a beautiful circle (of love?) in the middle. The rich butter pecan glaze complements the apple cake perfectly. This is a good recipe for your food processor: Using the chopping blade, chop the pecans on pulse. Switch to the slicing blade and place the apple quarters horizontally into the chute to slice. Thoroughly spray a 10" Bundt pan, including the tube, with the baking spray. Whisk well the flour, cinnamon, baking soda and salt in a medium bowl. Beat the brown sugar, oil and eggs on medium speed, just until well combined. Gradually add the flour mixture on low speed, about a cup at a time, and blend just until well combined. Scrape the bowl. Give a quick little extra beat on medium low. Stir in the vanilla, then fold in the apples and pecans. Pour the batter into the prepared pan, filling no more than 3/4 full. Place on a wire rack, cover with a clean dish towel and cool overnight. To release: Gently run a very thin-bladed knife around the edges and tube of the pan. Carefully invert the cake onto a serving platter and leave the fluted side up. Melt the butter in a small saucepan. Toast the pecans in the butter over medium heat, stirring constantly. Whisk in the brown sugar, cream and corn syrup, then bring to a rolling boil. Cook about 2 minutes, stirring constantly. Remove from the heat and blend in the orange extract. Cool the glaze until thickened. Drizzle over the cake, reserving some to spoon over individual slices. When ready to serve, slice the cake carefully with a serrated knife. (Sorry, my photo of the sliced cake didn't really show the circle of apple slices in the center.) 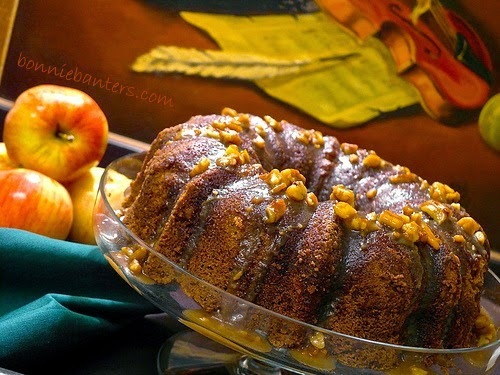 Because of the apples, refrigerate any leftover cake after a couple of days. 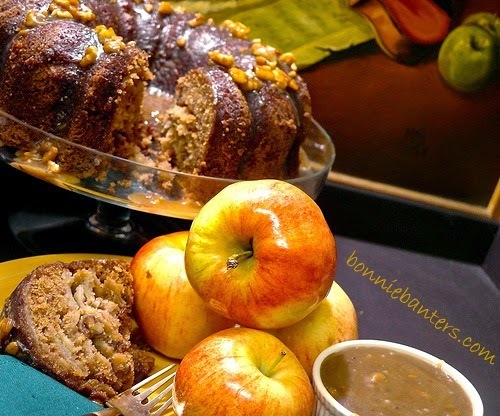 Enjoy autumn's bounty with this moist and satisfying, delicious apple cake...it would be perfect for Thanksgiving! The Bachelor Has Nothing On Him! Looking to expand your side dish repertoire? Here's a fabulous fall and winter accompaniment for your entrees, which just happens to be very easy and healthy too! It would go great with beef or chicken entrees and creamy pasta dishes also. This portobello saute is so good, it's hard to stop eating it...but that's okay, because it's so low in calories! It's All In The Prep! Clean the mushrooms by wiping with a damp paper towel or dry mushroom brush--do not wash. In a large frying pan, saute the garlic and onion in the olive oil and water over medium heat until tender. Add the baby portobello slices and tomato and simmer over medium heat for 6 minutes, stirring occasionally. Turn the burner off and stir in the bacon, feta cheese, salt and pepper. Serve warm. Leftovers can be refrigerated and reheated on the stove over medium-low heat. If you've got some hungry diners, they'll enjoy it so much, you just might want to double the recipe! Thought you might enjoy this update of my, now 14 and 1/2 mo. 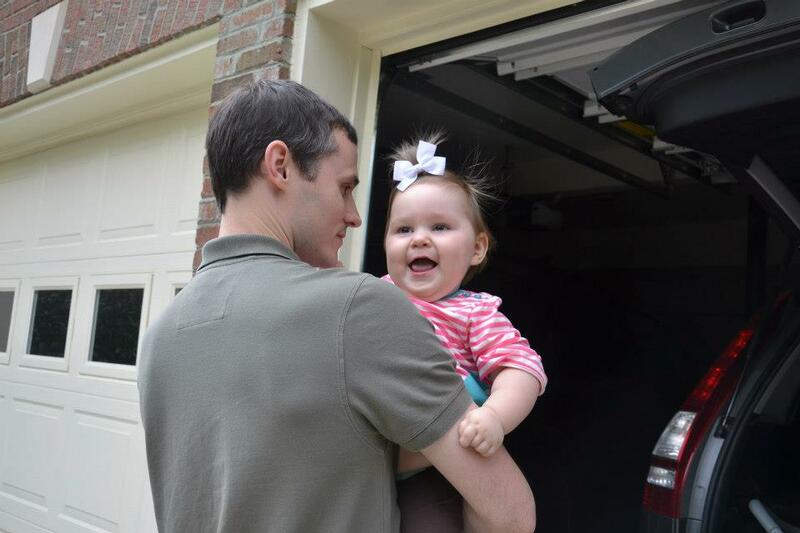 old, granddaughter with her dad (my son-in-law). Her mom likes to plant a bow on a sprig of what they refer to as her Conan O'Brien hair! Loving That Wind Against My Face! Not Just White Chicken Chili! I adapted this easy and delicious white chicken chili from a recipe which I requested from my friend Trudy. She has been sharing her marvelous white chicken chili with me for some time. This is my exception to no beans in chili...it just wouldn't be complete without them! It has a little kick, which is accentuated with the addition of shredded pepper jack cheese. As a bonus, I discovered that, by just stirring in sour cream, it makes a fantastic cold dip! So, this is not just a recipe for white chicken chili...you can use it to make chicken chili dip too! 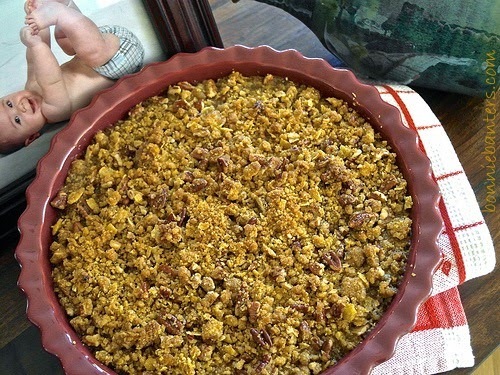 Trudy advised that she always doubles the recipe to share with friends and that it freezes well too. She suggested adding more chicken broth if the chili gets too thick. This is a wonderful recipe for stretching your meals by using any leftover rotisserie, baked chicken or my So Simple, So Perfect, Crispy Roast Chicken. Also, this is another dish that would be fantastic with my Dixie Girl Makes Yankee Cornbread! This is a great recipe to use rotisserie chicken from the store--or leftover baked chicken or My So Simple, So Perfect, Crispy Roast Chicken. In an approx. 4 qt. cooking pot, saute the onion in the oil on medium heat, stirring frequently, until tender. Add the flour, green chiles and cumin. Mix into a thick paste, or roux. Whisk in the chicken broth until the roux is thoroughly incorporated. Stir in the beans. Increase the heat to medium high and bring the chili to a boil. Reduce the heat to simmer and cook, stirring occasionally, until thickened. Stir in the chicken and pepper and simmer until heated throughout. The chili can be kept warm in a crock pot until serving. Freezes well. Add 1/2 c. sour cream to 4 c. of the cooked chili and refrigerate. Garnish with a dash of ground paprika and a sprig of parsley or cilantro (if you like). Serve cold or room temperature with tortilla chips for dipping. With the cold weather kicking in, you'll find this simple and delectable white chicken chili very comforting...enjoy! On Rosh Hashanah, it's customary to enjoy sweet dishes in hopes of a sweet year. 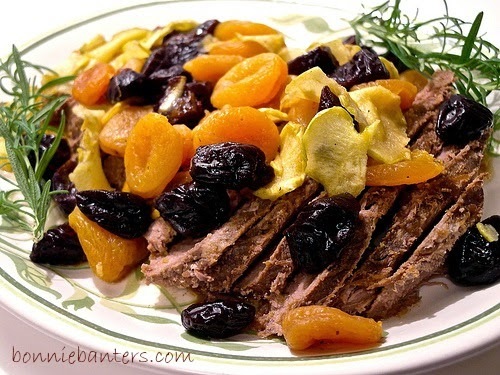 This Rosh Hashanah, we enjoyed this baked brisket with a sauce full of sweet, dried gems of fruit. This brisket is a delightful variation on the traditional baked brisket. It makes a beautiful presentation for guests and is surprisingly easy to prepare for family. You can bake the brisket the day before and finish off the dish with the sauce the next day. My husband was very serious about how his brisket was carved and would always take issue with a restaurant that didn't slice it properly. He was right....if it's not sliced against the grain, it becomes stringy and a whole different piece of meat that isn't nearly as good as when it's properly cut. For easier release, wet your measuring utensils with cold water before measuring sticky ingredients such as honey or marmalade. Pat the brisket dry with a paper towel on both sides. Lay the meat onto an 18" x 24" sheet of heavy-duty aluminum foil, fat side down, and sprinkle with the soup mix. Bring the foil up around the brisket and wrap in a tight package. Coat the inside of a roasting pan with the cooking spray. Pour the warm water into the pan and place the brisket package into the pan. Cover the pan tightly with the lid to the roaster or a sheet of heavy-duty aluminum foil. Bake for 3 hours or until a meat fork slides easily in and out of the meat. Remove the brisket from the oven. Transfer the hot brisket package from the roaster onto a shallow baking pan with sides. Carefully open the package, as steam will escape, and remove the brisket to a large, shallow container and let it rest. Pour accumulated natural gravy into a large measuring cup and cover. Chill the gravy in the refrigerator so the fat will rise to the top. Cover the brisket and chill in the refrigerator also. For best results, keep the brisket and the gravy overnight in the refrigerator. Otherwise, let the meat cool completely in the refrigerator before carving. In a medium bowl, whisk together the Worcestershire sauce, ginger, brown sugar, cinnamon, pepper, lemon rind, honey, marmalade, lemon juice and brandy. Stir in the beer. Gently fold in the dried plums, apricots and apples. Set aside. Remove the natural gravy from the refrigerator and discard the fat that has risen to the top. Set aside. Using a large spatula in each hand, and maintaining the brisket's original shape best as possible, carefully lift the carved brisket and place it into a small roasting pan. Pour the sauce with the gems of fruit and one cup of the natural gravy over the meat. Cover the pan tightly with the lid or a sheet of heavy-duty aluminum foil. Place the brisket in the oven and bake for 45 minutes to 1 hour, or until thoroughly heated. Remove the brisket from the oven. Lift the meat from the roaster, here again, keeping it's original shape best as possible, and place it onto a serving platter. With a slotted spoon, scatter the fruit over the brisket and cover with the sauce from the pan, reserving some of the sauce to serve on the side. 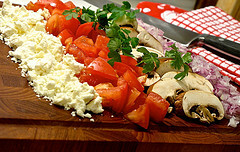 Garnish the platter with your choice of fresh herbs. I wish those of you who celebrate Rosh Hashanah a very Happy New Year...L'Shanah Tovah! Sorry I didn't get this post up in time for your Rosh Hashanah dinner...maybe you'll try it next year. It's so good, it still makes a great fall and winter dish and definitely a wonderful company dish..so why wait! Enjoy! Chili with Character ~ No Beans or Beans and Tailgates! Football season is here and that means tailgating...you need some chili with character! With terrific seasoning and coarsely chopped vegetables, this chili is full of character and the best I've ever had! I've adapted this recipe from one introduced to me by my daughter a while back. (She has a propensity for recognizing a good recipe when she sees one!) I've cut the original recipe in half for family meals; but if you want to make it for a tailgate or large crowd, just double it. 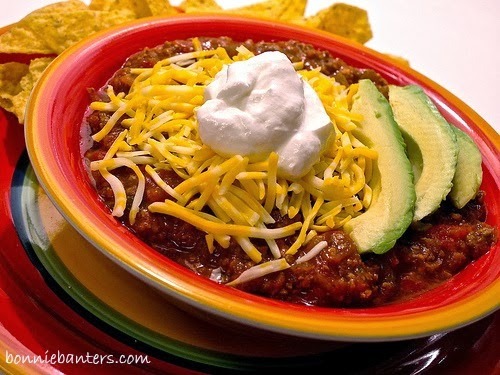 Prepare the chili on the weekend, and you can enjoy it throughout the week for lunch or dinner. You could double the recipe for a tailgate, or double and freeze half of it for another family meal later! For even more fun, add my Dixie Girl Makes Yankee Cornbread (which freezes well also)! Stir in the diced tomatoes and tomato paste. Add the celery, green and red bell peppers, jalapeno, bacon bits, bouillon and beer. Season with the remaining ingredients. Stir to blend, cover and simmer over low heat for at least 2 hours, stirring occasionally. Adjust the salt, pepper and chili powder to taste (I like the recipe just as it is!). The longer the chili simmers, the better it will taste. Enjoy hot...refrigerate leftovers; freezes well. And I'm A Happy Chick! You know by now that for recipes, I unabashedly peruse not only cookbooks, but magazines and newspapers as well. I always remind you to keep an open mind, as some of my best recipes have been inspired by these publications. I've adapted this recipe from the Fall/2011 Publix magazine "Family Style"...it's been on my to-make list all this time. It drew my attention because it looked like a healthy recipe to try in the unused doughnut-pan set, which was a gift from my daughter to her dad. Referring to them as "do-nots", I've always avoided eating doughnuts like the plague! I can only tell you that I wish I'd tried this recipe sooner and that I'm now excited to keep trying doughnut recipes in the non-stick pans! 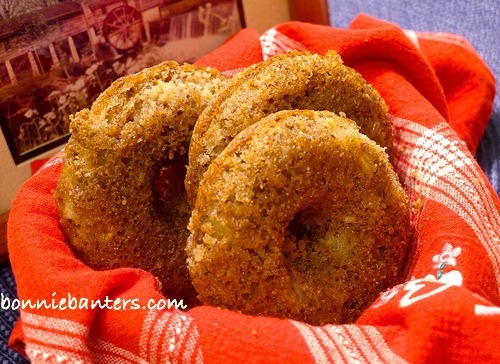 These easy and healthy baked whole-grain apple doughnuts are surprisingly moist, light and tender. Absorbing the marvelous apple glaze, these not-so-typical doughnuts are simply super good! In a large bowl, whisk together well the flour, flaxseed meal, sugar, apple pie spice, baking powder, salt and baking soda. With a pastry blender or fork, cut in the butter until the size of small peas. In a small bowl, whisk together the buttermilk, yogurt, egg and vanilla until well combined. Make a well in the center of the dry ingredients and add the wet ingredients just until combined (don't overmix). Gently fold in the chopped apple. Coat a six-cup, standard, non-stick doughnut pan with the cooking spray. Using a teaspoon, equally distribute the batter into the pan*. Lightly drop the pan on the counter to spread the batter evenly. Cover the pan tightly with plastic wrap and refrigerate for 1 hour. After the first 45 minutes of refrigeration, Preheat The Oven to 350º. Cool the doughnuts in the pan on a wire rack for at least 1 hour or overnight. The doughnuts will be very tender, so handle carefully: If necessary, run a very thin-bladed knife around the edges of the doughnuts and cup them with a plastic spoon to loosen. Invert onto another wire rack with wax paper underneath. *The original recipe directed to use a pastry bag with a 1/2" round tip to fill the pan. I knew better, but followed these directions. 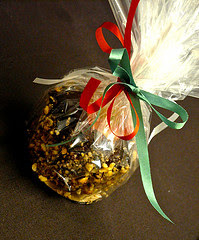 The flaxseed stuck to the bag; and it was altogether a messy, more time-consuming experience. Grant you, my bag is a traditional cloth pastry bag; maybe if I'd used a disposable bag, I would have been happier with the directed technique. In conclusion, I would discourage using a pastry bag for this recipe unless you're making a large quantity...and then, use a disposable bag. Whisk together the powdered sugar and cinnamon; and then, whisk in the apple juice. Using a plastic spoon, carefully add the glaze to the doughnuts or muffins...then, spread the glaze with the back of the spoon. Because these doughnuts have apple in them, I suggest you refrigerate any left over after a couple of days. Enjoy these doughnuts guilt free; because not only are they healthy and delicious, they're very satisfying... therefore, you will not be tempted to eat too many at once! Per Serving: 221 cal., 7 g total fat (3 g sat. fat) 47 mg chol., 368 mg sodium, 39 g carb., 3 g dietary fiber, 5 g protein. 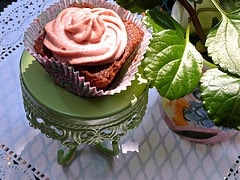 Chocolate Cupcakes with Cherry Butter Cream Filling & Frosting ~ Directions For Chocolate Pound Cake Included! It's chocolate and cherries! It all started with a jar of McCutcheon's amazing cherry butter...My son, who loves cherries, introduced me to it at a wonderful brunch he prepared for this past Mother's Day, and I became completely hooked! He discovered this lovely cherry butter at a local farmers' market. It's made from red and black cherries, and the ingredients include pure vanilla extract. Because I was just dying to pair it with something chocolate, I created a very easy cherry butter cream filling and frosting for these tender and delicious, chocolate cupcakes. I experimented with more than one batch of frosting: I added almond extract to one batch; and although my son loved this frosting, I decided I liked the first frosting I made in which I added no extra flavorings. With the almond extract in the cake batter, you just don't need it in the frosting. I didn't add vanilla because it was in the cherry butter. All the flavoring you need for the frosting is in this fantastic cherry butter! I've adapted the recipe for the cake portion from a chocolate pound cake recipe which was in the cookbook that accompanied my KitchenAid mixer. I don't have a date on this cookbook. Now, don't laugh, but it's probably from the 70's. (Are you starting to put my age together?) When my children were small, I made all my breads, in addition to lots of other baked goods, from scratch with my KitchenAid mixer. Never mind that my husband was sneaking store-bought white bread to my children while I tried to make wholesome breads for them! I digress...anyway, years ago, the local KitchenAid repairman (do they still have them?) said he'd never seen anyone almost burn up a KitchenAid motor! My one and only KitchenAid is like the old Timex slogan: "It takes a licking" (pun intended) "and keeps on ticking"! The creamy cherry frosting carries through to the middle of this luscious chocolate cupcake! Mix all the dry ingredients, but the sugar, with a fork in a large bowl. Sift the dry ingredient mixture alternately with the sugar into a large mixer bowl. Make a well in the center and add the butter and whole or 2% milk. Mix well on the lowest speed of your mixer. Stop and scrap the bowl. Turn the mixer to medium high speed (6 on a KitchenAid mixer) and beat 5 minutes. Stop and scrape the bowl again. Turn the mixer back to the lowest speed and add the eggs one at a time, beating 15 seconds after each addition. Add the evaporated milk, vanilla and almond extracts. Turn the mixer to medium speed (4 on a KitchenAid mixer) and beat the batter 15 seconds more. Using a large, scooped cooking spoon, fill the paper-lined cupcake pans about two-thirds (or 1/3 c.) full of batter, per cupcake. For even baking, equally distribute the mixture by adding or subtracting batter to each cupcake with a teaspoon. Lightly tap your pans to spread the mixture evenly. For easier clean up after baking, wipe any extra batter that spills onto the pans as you fill them. Bake about 22 minutes, or until a toothpick inserted into the middle of a couple of cupcakes comes out clean and the cakes spring back when lightly touched with the finger. Cool the cupcakes about 10 minutes in the pans...then carefully lift them individually with your fingers from the pans and finish cooling on racks, away from drafts. If you have one, add a mixer shield to your mixer to avoid the powdered sugar from flying (or cover the top of the mixer with a clean dish towel). Beat the powdered sugar with the butter; then beat in the cherry butter and the evaporated milk until well incorporated and creamy. Using a pastry bag with a large star tip (I used the bag and star tip from Ateco No. 1465 Pastry Set), fill each cupcake with the frosting: starting with the center, build to the top and using a swirl pattern, cover the top of the cupcake without going completely to the edges of the cake. Store in the refrigerator until ready to serve. This frosting would also be great on my Fudgy Classic Brownies or as a filling in my Brownie Sandwich-Cookie Cake! Use 1/4 of the cherry frosting recipe for the brownies and 1/2 of the recipe for the sandwich-cookie cake. Enjoy! 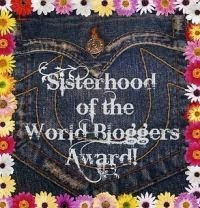 Disclosure: I have not communicated regarding endorsement with any of the brands referred to in this post. I mentioned them because I have enjoyed their products. Thought you would enjoy this photo taken of my precious granddaughter at her first birthday party which was held this past weekend. She managed to look beautiful even though she was very sick. Bon Bon Loves You Very Cherry Much!